Thick Plexiglass covers replace the boards that had protected the stained glass windows. 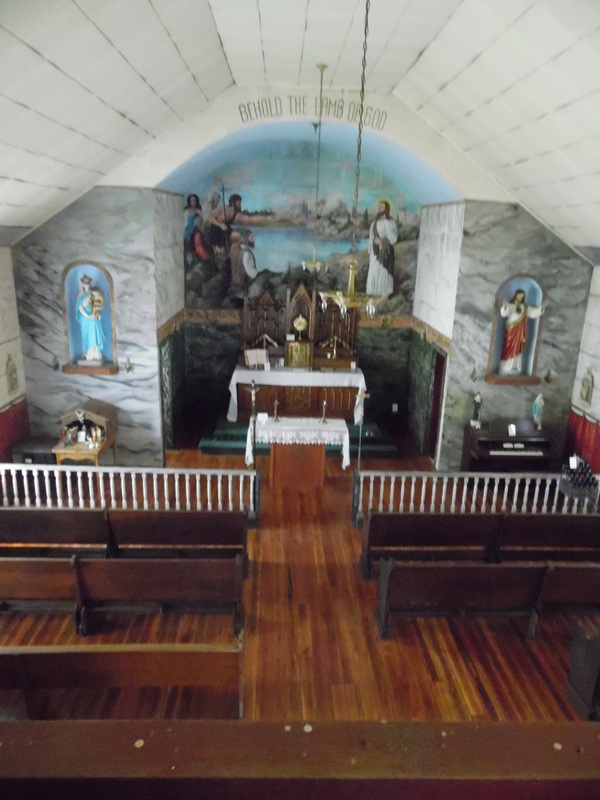 ​After many years without the money to properly maintain the church, a bequest from Verlyn Beethe and a grant from the United States Department of Agriculture led to the preservation of this beautiful church. 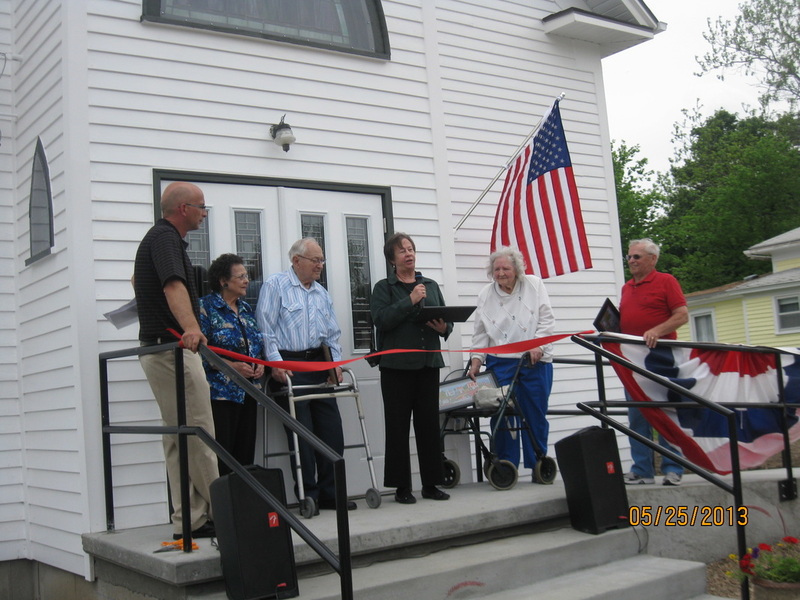 After foundation work and extensive work inside and out, it was rededicated in 2013. 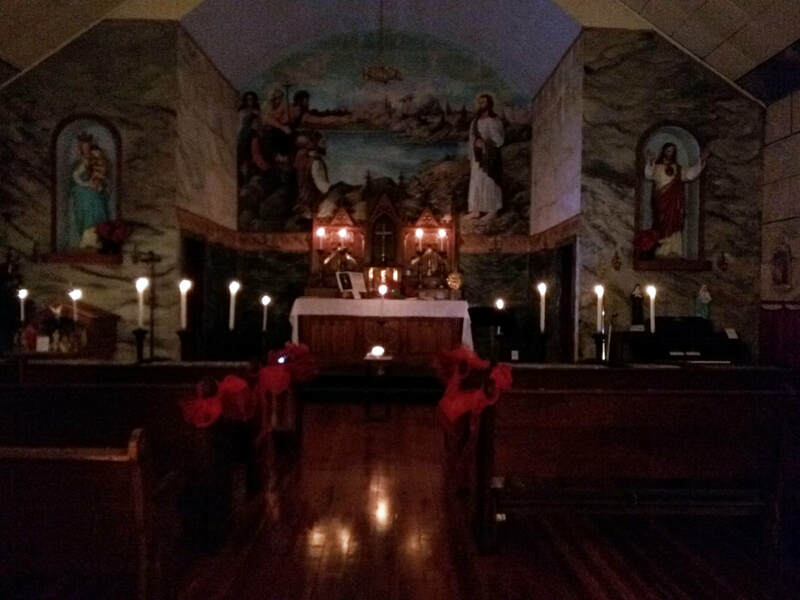 The Table Rock Historical Society led its fourth annual Candle Lighting Ceremony in Memory of Loved Ones Lost on Saturday, December 16. 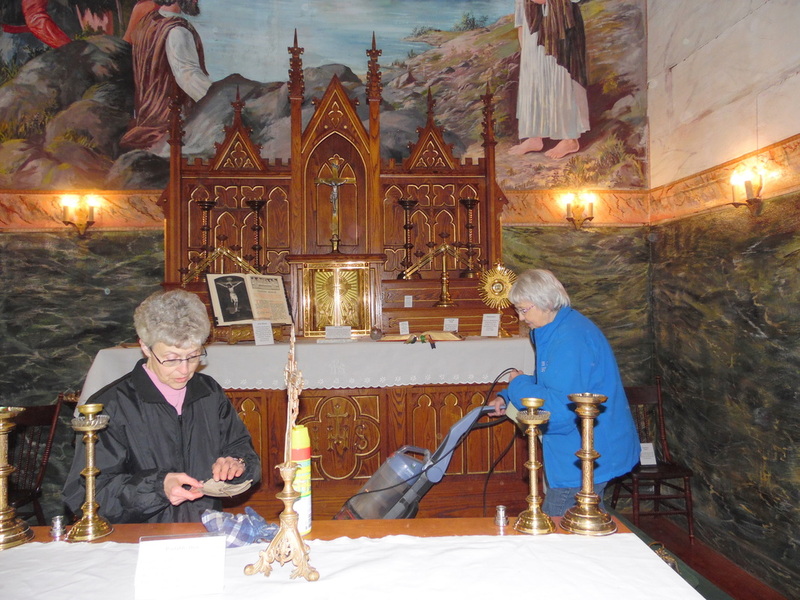 It was held at the little museum church in Table Rock, the Historical Society’s Museum of St. John’s Catholic Church, built in 1877. 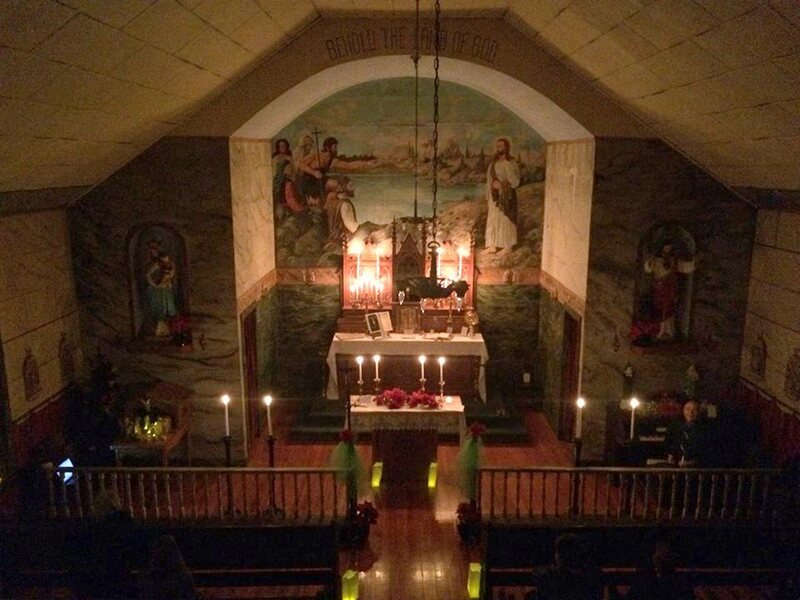 Participants arrived with the church lighted only by large candles. The ceremony opened with an acknowledgement of an event shared by all, death of a loved one. “All of the expectations, the hopes, the dreams of things we would do are fixed in time, never to be fulfilled. A limit has been set to the number of our memories. And we treasure them.” The gathering was explained as one for the purpose of sharing not memories of the loved ones, but rather for the act of remembrance. All of the large candles were then extinguished with one tiny candle remaining. It was used to light the first small candle, which was then used to light the second. The chain continued with each person saying who they were lighting a candle for. Children, parents, spouses. There followed a responsive reading with the response being “I will remember you.” Some of the lines included, “When the peonies push into the Spring and burst open,” “When dust on the rock roads chases our truck,” When fire flies rise,” “At the beginning of the year and at the end,” “When I have joys I want to share.” It ended, “When the chickens roost and the cows come home.” I will remember you. Words of contemplation followed before the little candles were extinguished and the short ceremony ended. For people who are missing a loved one, the holiday season can be difficult. The greater the joy of the season, the greater the feeling of loss can be. However, memories of the past may console in the present, which was the theme for the ceremony. It was another of the Society’s reminders of the relevance of the past. St. John’s Church is on Lot 1 of Block 40 of the Original Town of Table Rock. The history of prior ownership is as follows. All are warranty deeds unless otherwise noted. There are gaps in ownership to the extent that the grantor is not the same person to whom the land was granted by the previous owner. It appears that the church was in the earliest days often held in the name of the priest serving the parish. It is likely that the names of the priests were not carefully recited in the various changes of title. The date of the deed itself is still to be determined by a look at the actual deed. 4/12/80, recorded 4/27/1881, recorded at 7, 633. 10/24/1888, recorded 8/20/1917, recorded at 40, 12. 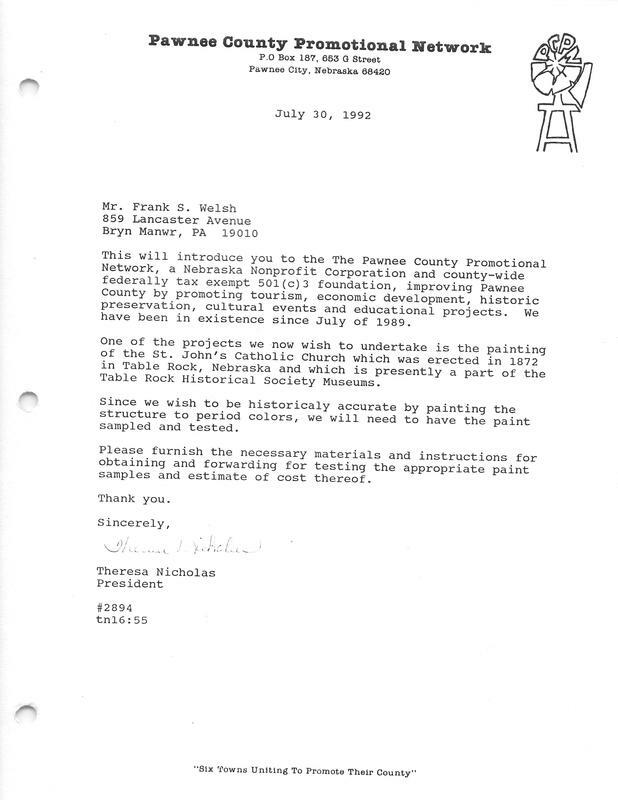 The state historical society does not seem to have records compiled under the Table Rock name, presumably as Table Rock's church was placed under St. Anthony's in Steinauer around the turn of the last century. There is a library listing for records of St. Anthony's with added information from "Pawnee County" churches. The bibliography includes the specific references for this history, generally found either as a Google book or as a digitized book of the University of Wisconsin - Madison. A 1987 history identifies the church only as St. John’s, that publication being “History of the Catholic Church in the Diocese of Lincoln, Nebraska, 1887-1987,” written by Loretta Gosen in 1986, published by the Catholic Bishop of Lincoln in 1986. However, it appears from first-hand sources that it was originally known by a different name. Father A. C. Raush, in his 1888 Report of the History of St. john’s refers to the church only as the Table Rock church. A 1999 Wymore history that includes the h of St. Mary’s Catholic Church in Wymore, a history consistent with Father Rausch’s history. 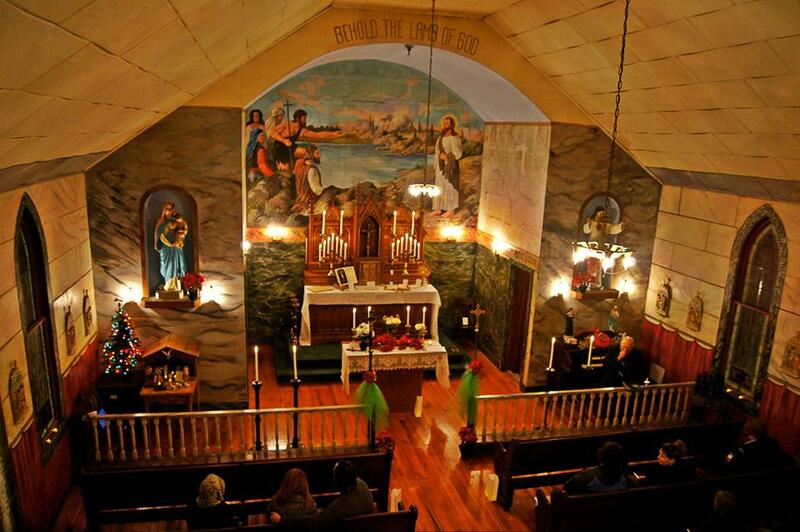 It says that the earliest Catholic masses were said in the homes of parishioners. The very first mass was said by Rev. Rausch of Table Rock and Tecumseh. The church at Table Rock was not named. In Mary Duder’s circa 1950s collection of remembrances Joseph Reuter, son of one of the founders, remembered that St. John's was originally called St. Wenceslaus. He received 1st Communion from Father Maley in August 1889 and he said that his 1st Communion certificate lists the church as St. Wenceslaus. He thought the name St. John was not used until the church was served by a priest from Steinauer. In an 1883 version of Sadliers' Directory, at pages 504-505, it lists St. Mary's in Wymore, Rev. 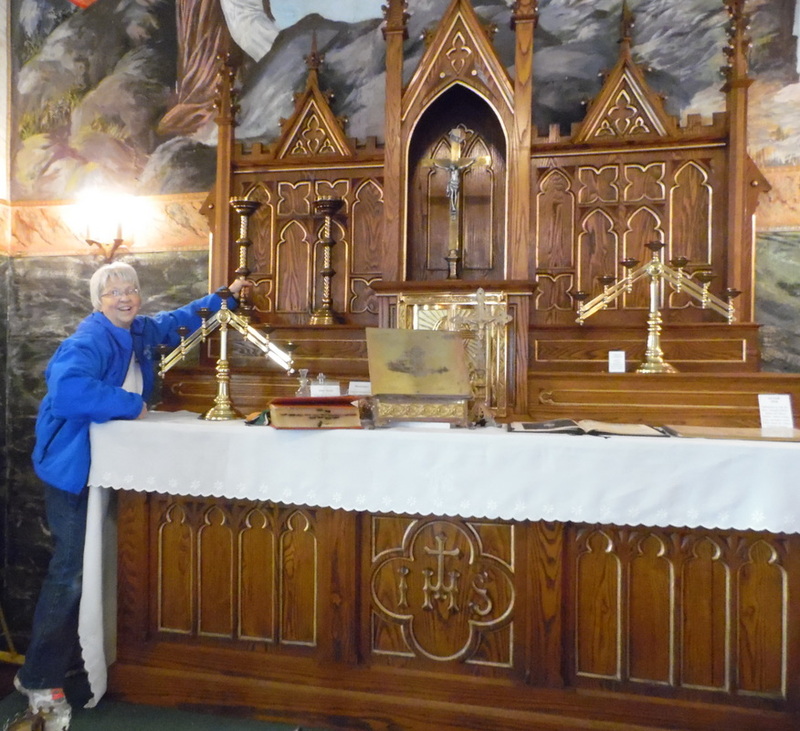 A. Rausch, pastor, with stations at Odell, Liberty, Burchard Church of the Sacred Heart; Turkey Creek, Pawnee County, St. Joseph; Table Rock, Pawnee County, St. Wenceslaus; and Humboldt (no church listed). It lists the Table Rock church as being under the Diocese of Omaha and served by Rev. A. Rausch, pastor, of St. Mary's in Wymore, and with stations at Sacred Heart in Burchard, St. Wenceslaus in Table Rock; Humboldt; Odell, Barneston in Gage County (no church listed), and Turkey Creek in Pawnee County (“Turkey Creek” was generally a reference to the Pawnee City area; the Steinauer area was generally referred to as “upper” Turkey Creek). The Hoffman's third annual edition in 1888, at page 273, lists Table Rock's church as being in the Lincoln Diocese and the name the church as St. Wenceslaus, "attended from Wymore." 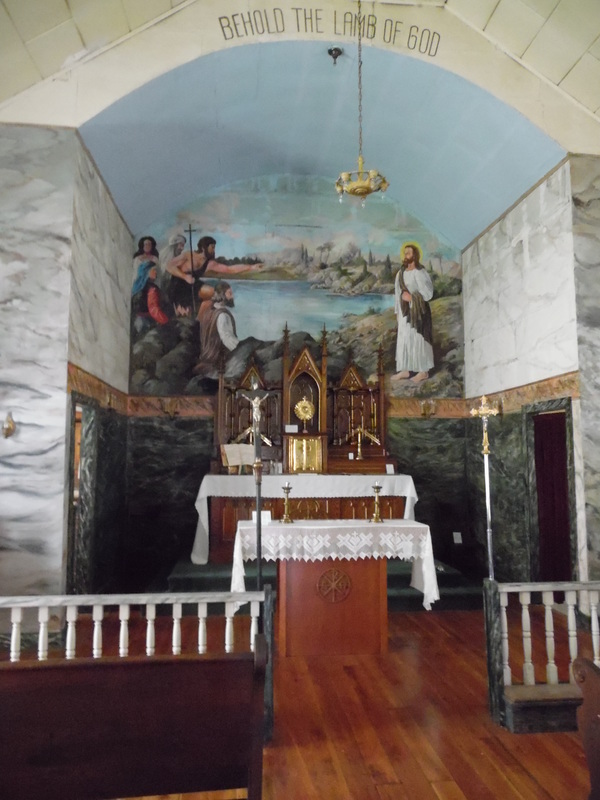 The church at Table Rock is identified as “St. 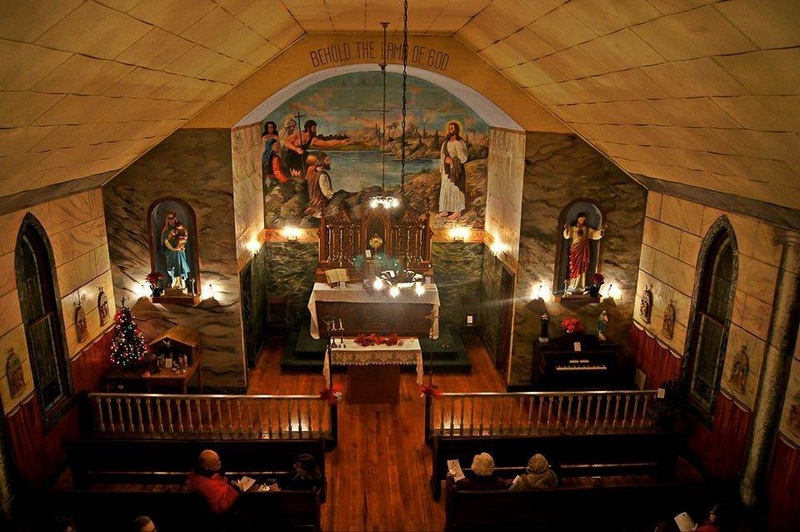 John the Baptist Church,” a mission of St. Anthony of Padua in Steinauer, in the Lincoln Diocese. 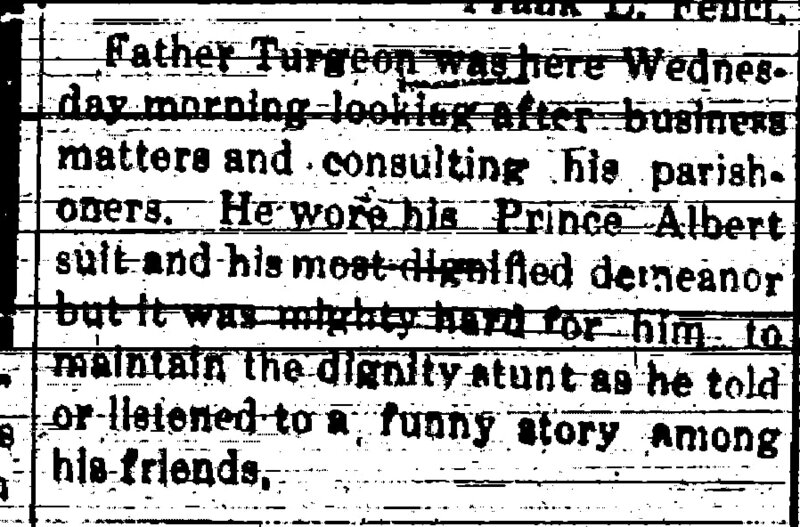 The December 6, 1918 Argus mentioned a visit by Father Turgeon, who is listed in the history as being assigned to Table Rock between 1914 and 1921. He was apparently quite a personable man. 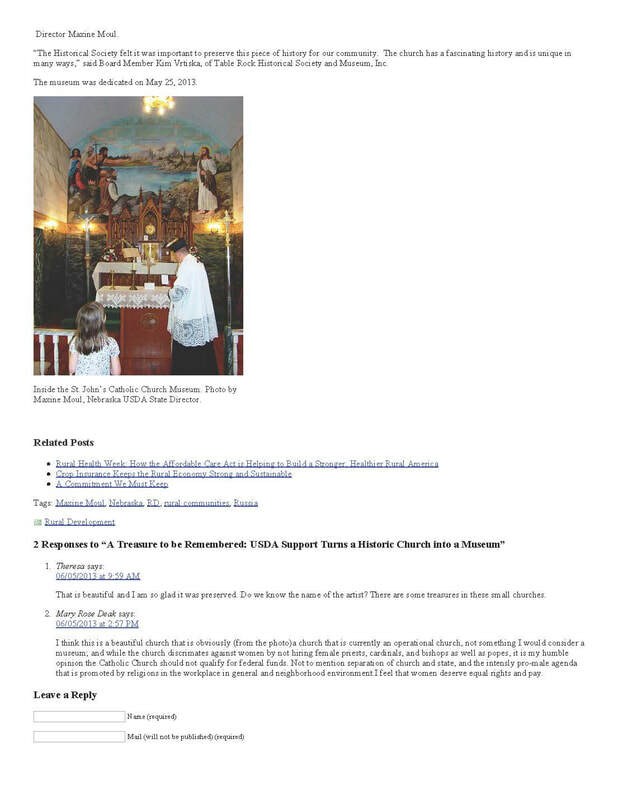 ​This publication about heritage churches by the University of Nebraska addresses all Czech churches, both Protestant and Catholic. "Because of the lack of ordained ministers, the Protestants families began to conduct devotions in their own humble homes. As the word spread about the fertile land of Nebraska and more Czech Evangelicals arrived, there gradually appeared about a dozen congregations, which were organized in the following areas: Prague, Wahoo and Weston in Saunders County; Zion and New Zion in Colfax County; Bohemian Brethren in Omaha and Bethlehem in South Omaha; Thurston in Thurston County; Wilber and Crete in Saline County; Table Rock in Pawnee County; and Burwell (Sedlov) in Valley County. Of these original twelve thriving congregations, only the first eight survived to the present time. 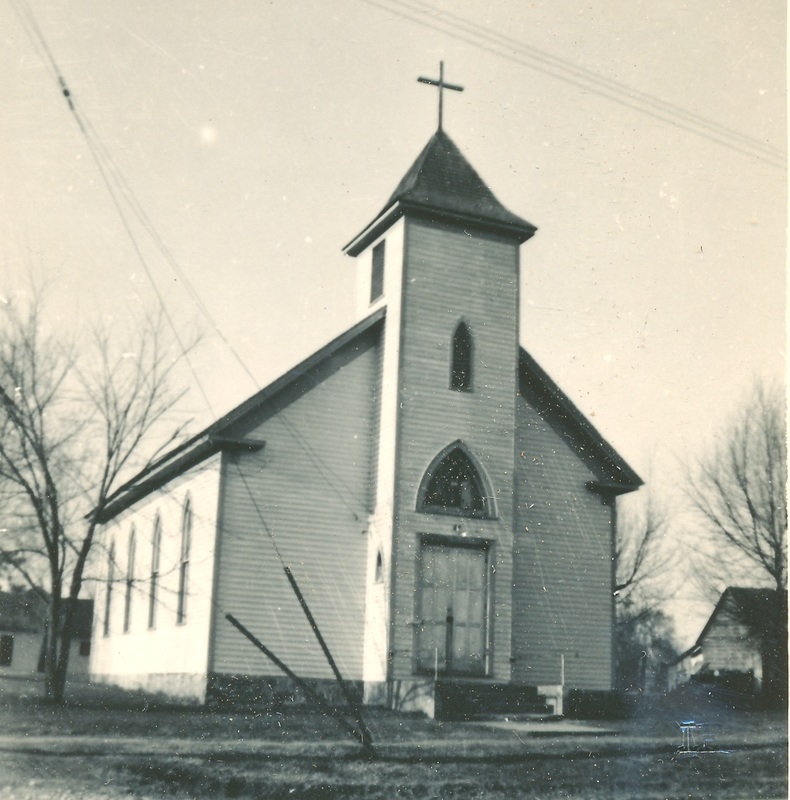 In 1921 an additional church, the Bethlehem Chapel near Howells was organized. 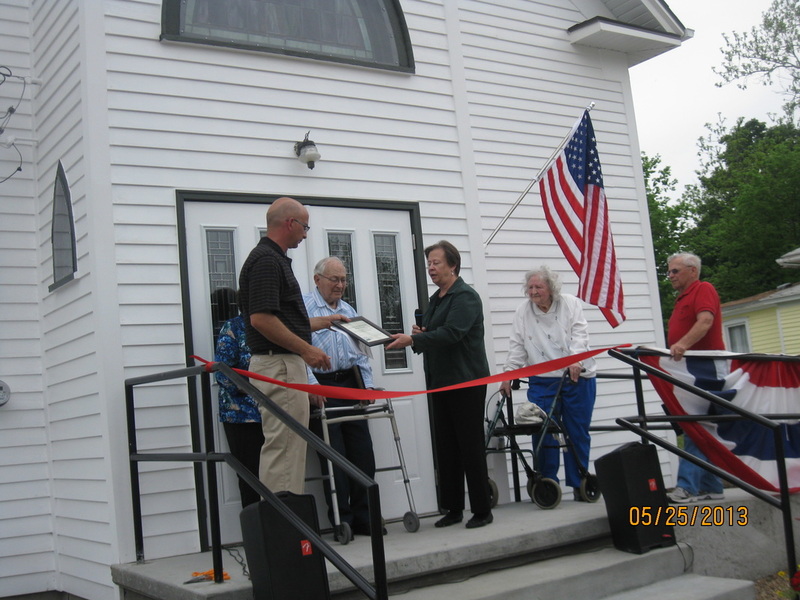 It has become a part of the Larger Parish of “The Second Mile”, comprising also the Zion and Webster churches in Colfax County." "a treasure to be remembered"
The U.S.D.A. 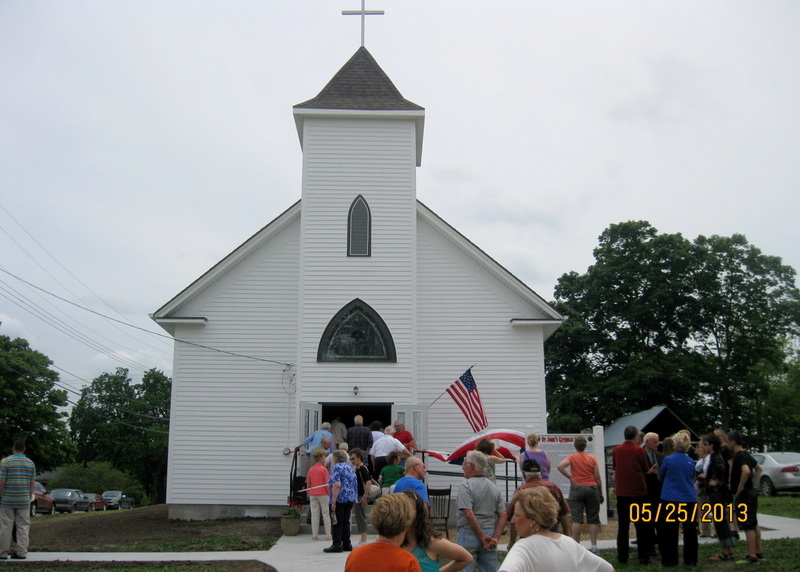 matched funds of the Table Rock Historical Society for the restoration of the church in 2013. This history begins with the formation of the diocese in 1887. Table Rock is not cited, but it became part of that diocese once it wa formed.